Now I start that work again. I am sorry on my previous attempts to proceed several things at the same time. It led to confusion. So this time I focused on the station information and split this from thread : More graphical symbols!. Currently there is no consistency because symbols and text are mixed. Also, as pointed out by Frank, not all fonts also have face fonts. There ware opinions that tool tip help is necessary for symbolizing. -It is now possible to launch even if there is no icon pak file. NOTE: When there is no icon, it is the same display as before. In order to display icons, four icons must be present. -The text of the tooltip diverted the existing text as much as possible. The explanation of the icon is the same as the help text of the chart button. Only one translation word - "Passengers:" is newly required when using symbol icon. This intentionally distinguishes it so that you can prepare a suitable translation for this place. For example, in the case of Japanese, the word "旅客の評価"(passenger's evaluation) was originally used here, but if divert "Passengers" it will become "旅客"(passenger). -I added the same notation as chart label on tool tip. This will clarify the relationship between the icon and the chart. Do not use png and pak which previously I attached to that thread. You can change the design by preparing pak files. Conversely, if you delete those files you can return to the previous display. Please refer to attached dat and png file for how to make icons. I attach a modified version of png and pak file. Please tell me the face icon about this matter of you, HAPPY or UNHAPPY or (´・ω・｀)? Color ideograph icons are good, but the colors need to match. You have a yellow happy face that corresponds to the white line on the graph, an orange frowny face that corresponds to the red Unhappy line, a red "No entry" symbol that corresponds I suppose to the blue No Route line, a yellow blob of some sort that corresponds to who-knows-what color on the graph. 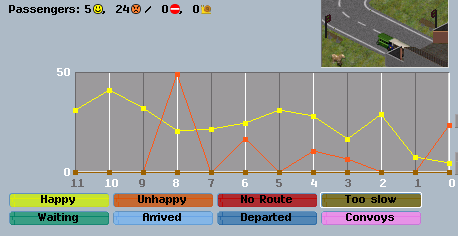 Instead, you should have a white happy-face for the white line, change the graph's red Unhappy to orange for the orange frowny-face, make the graph's No Route be red to match the No Entry icon, and clarify the fourth icon by making sure its color matches the corresponding legend and line on the graph. Then the whole thing starts to really make sense. Right now it's confusing because of conflicting color meanings. Thank you very much for this: this is most helpful. First of all, I do agree with W. Lindley that it would make sense for the overall colour scheme of the icons to match the colours of the chart. Yellow is a well known colour to associate with a happy face, so in this case it might well be worthwhile changing the graph colour for this (a straight swap with "waiting" should suffice). If we are looking at this, I do suggest that we reconsider "unhappy", as this has a more specific meaning than the word "unhappy" usefully conveys. It refers either to overcrowding or excessive waiting time. I wonder whether this specific meaning could be more usefully conveyed both in text and graphics? Also, I should be interested in feedback from others on these proposed changes. but the colors need to match. Yes, it is exactly right. I agree. Thank you for pointing it out. Changing the color definition may affect others, so I checked the whole and changed the color. The color was referred to other windows. "Convoys" is "Convoys" of Line manager, "Waiting" is "Congestion" of City window, "Arrived" and "Departed" are "Transported" and "Passengers". Are these colors getting better? I do suggest that we reconsider "unhappy"
This problem was also pointed out by Vladki before. Certainly I think Unhappay is an expression that also includes No route and Too slow, but there is a difference whether their travels were succeeded or not. So I put "/" instead of "," here. how is it? If we add a distinction between "overcrowding" and "excessive waiting time" later, it will be on the left side item. Color: purple is left for "overcrowding". I think that it is better to break "Unhappy" when separating "overcrowding" and "excessive waiting time". If there are more appropriate short word to express the meaning that the trip was successful but could not be satisfied (caused some kind of problem), you can also respond by changing the translation file. I am on a train now so can only reply briefly, but I note that it is not correct that the journeys of "unhappy" passengers succeed: they are either turned away from the station because it us too full or wait so long for a service that they give up. Just yesterday I was thinking about unhappy / no route / too slow. Overcrowded stop is clear. But how about waiting time? Does it mean only waiting at this stop? Shouldn't it fall under too slow? And even if I see lot of too slow, it might mean that the problem is somewhere further on their route. How about one more category "too expensive"? Showing passengers that would travel if there would be lower class transportation available? 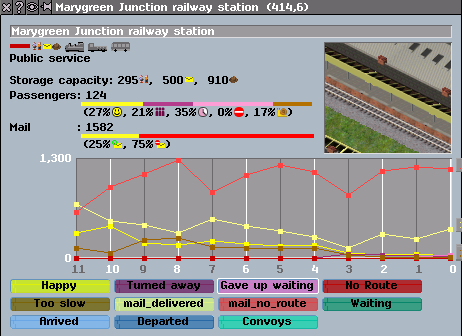 Passengers came to the station, but were they angry and stopped departing? If so, I think that Unhappy is not suitable and I can't think of any suitable words. Is it advisable to separate it into "overcrowding" and "excessive waiting time"? Also "/" Needs to be returned to ",". By placing text as a symbol, we can afford space, so I think that we could afford to add new items. It is a good thing if it can clarify the issue that is occurring, but I do not know how much work it is. Is it easy to add a distinction between "overcrowding" and "excessive waiting time"? EDIT: Now I check Unhappy case. Is this all? Is my understanding correct? Thank you for your thoughts on this. I am a little confused by case 4, as passengers do not leave and register as unhappy merely because a particular convoy is overcrowded. Can I check to which line in simvehicle.cc to which you are referring? There may well be much sense in separating case 1 from cases 2-4, as this is different in nature. The symbol for waiting too long might be a clock face whereas the symbol for overcrowding might be a symbolic representation of three people in close proximity. Separating these would require adding a graph and a dataset for the new distinct type, which would require altering the saved game format. I presume that you know how to do this? Other than that, it should not be too difficult in principle to do this. I should be grateful for others' views on this separation. Adding a display for "too expensive", by contrast, would be much more difficult, and would also greatly increase computational load, as passengers would have to search not only for routes that they can afford but also for routes which they cannot afford to check whether there being no routes that they can afford is because there are no routes at all or because there are routes but only ones that they cannot afford. I do not think that this would be sensible. So at the moment "too expensive" is not distinguishable from "no route". So the exact wording would be "no route in given class". For cases 1 and 4, is there a way to distinguish between waiting too long because the interval is long - which is predictable, and should be accounted for when estimating the travel time - and waiting too long because all vehicles are overcrowded? Does #3 really matter? You cannot get off on overcrowded station? That is such an outstanding feature that I personally would like to be seen incorporated into the main game. 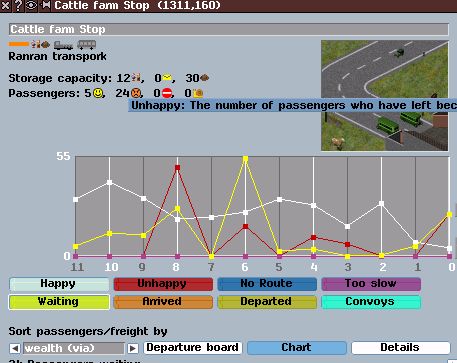 Yes - in the first case, the passengers are not currently recorded as "unhappy" at all, but as "too slow", as the journey time takes into account the waiting time. Only in the second case are passengers currently registered as "unhappy" (case 1 in the table). As to overcrowded stations - the point is not that the passengers cannot get off the trains/buses/etc., but that they cannot get into the station to begin their journeys. In relation to labelling "no route", "no route in a given class" might be more correct in the circumstances. I am a little confused by case 4, as passengers do not leave and register as unhappy merely because a particular convoy is overcrowded. Can I check to which line in simvehicle.cc to which you are referring? // Halt overcrowded - discard passengers, and collect no revenue. // Experimetal 7.2 - also calculate a refund. 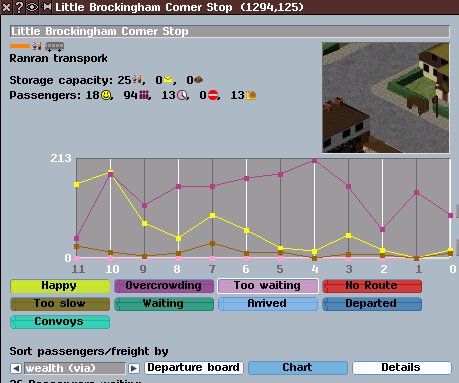 // Add passengers to unhappy (due to overcrowding) passengers. Sorry, that was my misunderstanding. It seems also the station is too crowded at simvehicle.cc line 905-934. I presume that you know how to do this? Other than that, it should not be too difficult in principle to do this. Probably I can do it. I will try if separation is preferred. The symbol for waiting too long might be a clock face whereas the symbol for overcrowding might be a symbolic representation of three people in close proximity. This is still not in-game image but how's this? Those symbols look good to me - thank you for that. You will need to colour co-ordinate them with the graphs, of course, but no doubt you are aware of that. As for incrementing the saved game version, you need to increment EX_SAVE_MINOR in simversion.h and then load/save the new values only if file->get_extended_revision() >= [the new incremented number] OR file->get_extended_version() >= [one greater than the current major version number]. Also, what are others' views on (1) the separation in principle; and (2) the new symbols? Here is the new in-game screenshot. Please tell me the words that are appropriate for the new two separated labels. Also I would appreciate if you could tell me impressions about the icon and color of the chart. The color of "Convoys" gave the same color as "Convoys" of City list chart as a result of giving priority to "Too waiting". Thank you for this. I suggest "Turned away" and "Gave up waiting" instead of "Overcrowding" and "Too waiting" respectively. The tooltip texts will also need modifying to "The number of passengers who have been turned away from this stop because it is overcrowded" and "The number of passengers who had to wait so long that they gave up" respectively. I think that it may be difficult for player to understand that "Gave up waiting" occurs at other stations(not a departing station). Thank you for text advise. - I updated my Github branch. - Symbol files attached to post # 1 has been updated. Now Ranran challenges even more combos. Simutrans's GUI has many indicators. Speed, distance, capacity etc. The station information window has a subtle margin. So I came up with put a indicator here. Unlike the above indicators, this displays percentage distribution. If only the flattened banana is visible, that is a proof that you are a good president. It becomes gray when there is no data. #1 - Just added an indicator below. #2 - In order to make it more meaningful, I have added the total number of generated together. But this is not enough space on the right side. It will cause problems at stations with millions of passengers. So #3 and #4 moved the total number next to the indicator. I also tested the appearance when the indicator height was made thick. I like the approach, and I understand the difficulties. What if you write out the total amount of passengers, and then split it up into percentages? Using your example #2 (which I think I like the best. #4 makes the filled bar smaller and smaller the more passengers there are, #3 does that as well, only now it is unclear what the number means and #1 doesnt tell me how much passengers are the total), it would spell out 754 (76% , 9% (crowded icon) etc). You would only have to make sure that the percentages add up tp 100, and not more or less due to rounding errors. That would save you alot of space for when there are alot of passengers. After some weeks of squinting, I am guessing the rightmost yellow "blob" icon is a snail? This is a great addition to help players understand their network. Are there tooltips for each entry (icon + value)? I agree entirely with Ves on which is best. Can we add a poll to the topic if anyone has another opinion? Thank you for telling me your opinions. Those were very helpful for me. I thought it was a good idea to display it in percentage. However, in this case as well, there is not enough space because "%" characters increase. yellow "blob" icon is a snail? Yes. Is it unclear? Icon size is just 10 px square, so it's quite difficult. I hope the player can understand once by assisting with tooltip help. Are there tooltips for each entry (icon + value)? Yes, you move the cursor around the icon, then the tooltip is displayed. Another idea is to separate the line with "Passengers:". In this case it may seem somewhat unnatural with consistency with Storage capacity display. When will this all be incorporated into the main game? Oh, you are right, it gets very long indeed! I would think it is always best to have the total amount of passengers immediately after the description "Passengers:" since you otherwise could get confused about what that number is all about. and move the passenger count one line up (next to "Passengers:"), and then keep the percentages and the filled bar on the lower line, but make it so that the first percentage, as well as the left end of the filled bar, is directly below the passenger count? I believe that would make it look like one unit and the player would hopefully automatically group that together to be all about passengers. Thank you for your opinion. Now I have made some improvements. - Separated the record about mail. 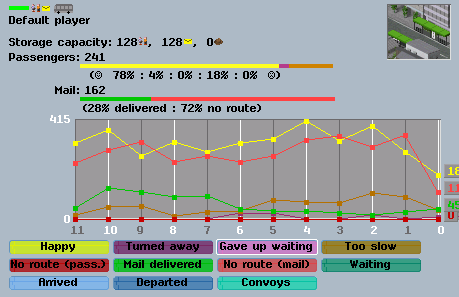 Previously, mail enabled stops counted the no route of mails together. 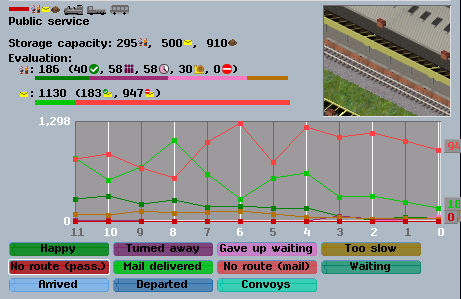 Therefore there was a issue that mail stops always display red indicator or adding a lot of no route (mail tends to be no route so as not to look for alternate routes) when both passenger and mail are enabled, so it needed to be fixed. However, I thought that the record of mail was also useful information, so I separated it and made a new item. These are only two of delivery success and no route. If we need discussion on mail statistics, I think that it is better to do with another thread. - Delivery success count of mail and no route added to the chart. Proofreading on labels and help texts will be a great help. - I added two special icons of mail delivery success and no route. If pakset do not have these two, "Happy" and "No Route" of passengers will be displayed instead. - Passengers/Mail evaluation display will be hidden if those services are invalid. (1) There is no waiting passenger/mail and the arrival of convoy has not been past 2 months. (2) There is no waiting passenger/mail and there have been no users in the last 2 months. I think it looks much better like that! There is only one thing that I find look a little strange, and that is the placement of "mail" so much too far to the left of the colon. Either I think the entire mail entry needs to follow up directly after "Mail:", or even better I think: The "Mail:" needs to be moved much right so the colons are benieth each other. Be aware, of corse, that in other languages, mail might be a longer word than passengers, so you would need to find out which one is longer before determining where the colon should be placed. Am I making sence? If I read "passenger service not provided" I assume that is because there actually is no passengerlines or -convoys that are scheduled to stop at that stop. If, however, there where a problem somewhere that hinders my convoys to serve the stop and the two months had passed, I would much rather have it written out "passenger service interrupted" or "passenger service down since 2 months" or something similar that states that there is a problem. Another point that I have been thinking about, but which would require some work, is that everywhere else in the game, the color yellow has been associated with some kind of attention to problems of some sort. However the color green is the color that is associated with "everything is fine". I know that this makes it a bit difficult for this situation, since a smiley normally is yellow and you made the graph and the color in the filled bar yellow to match that. What I wonder is what do you think, and ultimately, how it would look like if you either added a green hint on the smiley, or made the smiley green, and all associated yellow colors green? My thanks to both of you. Those are very helpful. The "Mail:" needs to be moved much right so the colons are benieth each other. What (1) intends is, judging from the state of the station and the record, the station has a passenger (or mail) attribute , but in the months a (mail) convoy is not in operation there and there is no record on passengers(or mail). Roughly speaking, "No (mail) convoy operation past a few months". NOTE: Mail can accurately determine the presence or absence of mail convoy, but passengers can not. (It may be that just I do not know how to do that, and of course if you add new code it will probably be possible). Thus, in the case of passengers, it will announce whether there is a convoy being operated. (2) shows the situation where the passenger's (or mail) convoy is operating but there is no user at all (eg the station is on the wilderness). Are these explanations gotten to the point? I am not an English speaker, so I think I can not prepare a suitable English text there. Can you think of text that accurately conveys these to players? Due to the problem of the number of characters, it can not be a long sentence. You can refer to above images for restrictions on the number of characters. how it would look like if you either added a green hint on the smiley, or made the smiley green, and all associated yellow colors green? Yes, I noticed this point. I also know that Ves has written TODO about station status (text) in the code. Station status bar is indicates whether or not it is operating normally like signal. And it displays only one color but evaluation indicator is "帯グラフ". Band graph? Bar chart? It does not seem to have a dedicated word like Japanese. Since it use many colors at the same time, the possibility of color conflict is high. And in this window, a happy icon suggests the meaning of color. Thinking back to this post, there are a couple of things I disagree with. 2) I think percentages (at least to 0 d.p.) are too imprecise, at least for small numbers. Maybe they have benefits for big numbers where the exact value is unimportant, but for small values I think it would be better to give an exact value. For example, I'd rather be told that 2 out of 1000 people left because they were waiting too long, than be told that either 0% or 1% of people were waiting too long. Perhaps a better algorithm would be to compute the percentage to 2 significant figures, rounded down (to avoid the problem of stuff rounding to 100%; alternatively we could scale by 0.995 and then round to nearest). We then display the percentage only if it uses fewer characters than the exact value (so for <1000 passengers the exact value is always used, for more than 1000 passengers the exact value usually won't be used, unless that is less than 10% of the total (so the total is more than 10000), and for more than 10000 passengers the exact value would only ever be used with more than about a million passengers in total. (5) a green face would not be a good idea as the person would look ill; perhaps a green tick or similar would be better (if green be used, the graph colours should be co-ordinated). Thank you very much for your work on this: this is most helpful. What about the two labels on the chart? I am putting temporary things now. - "mail_delivered" and "mail_no_route"
Is it reasonable to swap the order of Too slow and No route? Since Too slow has a route, measures such as speed up and increase convoy can be taken, I think that the problem is lower than No route. For the labels, it is probably better to have "Mail delivered" and "No route (mail)" together with "No route (passengers)" or "No route (pass.)" if the latter will not fit instead of simply "No route". Swapping the order seems sensible so that the best states are to the left and the worse to the right. True, a green face would probably look more ill than happy 😛 but a green blob like on the mail could work! Percentages over actual numbers, I see the point of the case with "2 out of 1000", however, I don't see that it really would make a big difference to have the actual number displayed. I would think that if there is less than one procent that, say have no route, it could display as <1%. Whenever you see that, you know that it is indeed "very few passengers". Ok, if you have a station with a million passengers, 1% means 10.000 passengers, however that can easily be fixed by adding decimals to the percentages, for instance add one decimal when the passengercount reach 100.000 (0,1% of 100.000 is 100 passengers, so <0,1% means "less than 100 passengers"). As to the rounding errors that might occur, I DO think it must add up to 100%, at least by numbers (excluding the < sign). It should round up between 0 and 1 procent, round normally between 1 and 99 procent and round down between 99 and 100 procent. That would mean that if you have one passenger out of ten thousand, that category would show as 1% (with the added <), and the rest of the categories now only sums up to 99%. I would prefer to have the percentages displayed at all times, and then the actual numbers in the tooltip. Thank you for your feedback. Based on them I added some modifications. Which is the better? and how is the appearance of the green bar? I think that it is necessary to change the name of "Happy" if it is to be a green icon. In # 1, the actual number is displayed in the tool tip. I do not think that actual numbers are so important. Because when you think that you want to know it, you will be able to quickly check it with the chart below. Unfortunately, however, we can not confirm because it is now broken and the number is now out of sight. I made the right margin the same as standard, but still can not see the part that protrudes. There is certainly ambiguity, but this display is reset every month so the beginning of the month is always inaccurate. And the smaller the problem, the greater the fluctuation of the month. It might be better if the annual indicator is somewhere. Check for other cases, if pakset does not have an icon, 64-size pakset, mail bar and chart color and label. I did not want to divide it into two lines from the viewpoint of layout (such as gave up waiting and too slow and no route thing), so I made it like this. I think that it is unnecessary to place much emphasis on cases without icons. If integrated this, 128.britain-ex will be provided new icons with exe. Other pakset can also be copied from 128.britain-ex. Hello, just a quick note. Showing the absolute numbers is imho more interesting, as the percentage can be roughly estimated from the color bar. Also I would prefer putting all the numbers in one line to save vertical space. Tooltip would be nice for explanation of what each icon means. I agree with that point. The problem was the width when the number grew. This is a composite image to check the margin. The all-icon version is excellent, although it could use a bit more vertical space below the "Evaluation" label and between the line groups. I like this layout alot! If it works with numbers, then I do think it is fine. A quick note that it appears you have one single space to the left of the passenger and mail icons, that technically could be more useful among the evaluation entries. Also, the icon you have now instead of the smiley I think works great, even bether than the previous smiley did! You made the green bar darker on the passenger evaluation than it is on mail evaluation, may I ask why they are not the same green? The darker one sure does look less "in your face" than the light green, so perhaps changing the mail green to the passenger green? What about the red color, is there a red that does not shine as much to accompany the darker green? At first glance, is the opinion that you guys want to change Happy face to Green one advantageous? You made the green bar darker on the passenger evaluation than it is on mail evaluation, may I ask why they are not the same green? It is not necessary to distinguish the color of the bar by passengers and mail, but it is necessary to distinguish it in the chart. The mail icon is a color of green check and the yellow of the mail, so I made it look like a mix. Should it be used the same green and red on the bar? I would like everyone's opinion on this point. Red is now this color. Here is a sample of colors that can be set in the GUI. Corresponds to lightening when not pressing the button. I do like this - this does make things rather clearer. One small thing: I think that I prefer the green check not in the circle to the one with the circle. Other than that, is this ready for final testing and possibly implementation so far as you are concerned? Yes. One thing that I care about is the label text of "Happy" is OK? But this can be edited easily using the translation function. I think that I prefer the green check not in the circle to the one with the circle. I replaced the image. Before you test you need to make a pak file. The source file is here. I attach the dat file of the translated word to be added. I do not have time to test this evening, but it is an interesting question whether the word "happy" should be changed either in the base texts or the translations. I suspect that it may be better to change it in the translations so as not to interfere with existing translations, but I wonder whether "Pass. transported" might be better? Thank you very much for your work on this: I am testing this now and it does look good. One very small thing: the text for "No route (pass.)" and "No route (mail)" in the buttons for the chart seems a few pixels higher than the other text for the buttons. Do you think that you could adjust this? the text for "No route (pass.)" and "No route (mail)" in the buttons for the chart seems a few pixels higher than the other text for the buttons. Do you think that you could adjust this? I thought whether it is on above because of lowercase "g", "q", "p" and "y", but it looks a little bit higher in Japanese too. Then , why don't you lower it by 1px when the button is pressed like this? Thank you very much for this. Looking very carefully at the buttons, it seems as though all the text might be slightly high, although I am not sure why; however, I do like your idea (and implementation) of lowering the text when the button is pressed. In any event, I have now incorporated this, as any further issues that there might be are very minor. Therefore, the game with this new feature will be available from to-morrow's nightly build. Thank you very much for your work on this - it is much appreciated. Thank you for testing and incorporating and many feedbacks. W. Lindley - is this an error that you can confirm relates specifically to these changes? I could reproduce the error while compiling with mingw64 g++ compiler. std::round is introduced from c++11. So you have to set the build option -std=c++11 or use other function. I threw a pull request for fixing this. Interesting. I am in the process of incorporating Ranran's fix, but I should note that C++11 is, I believe, the standard now for Simutrans (and Simutrans-Extended) code; the thread_local keyword is used in Simutrans-Extended, for example, and this is part of the C++11 specification. Maybe there is missing header file in gui/halt_info.cc. then I could compile it. It also worked well on pak256-Ex! Looks good! As stated in this post on this very thread, these changes have already been incorporated.